Thank you for your interest in submitting a proposal for the fall 2018 LLNE meeting. The LLNE Education Directors, Danitta Wong and Shira Megerman, are looking for speakers from all libraries in all departments. Libraries today move at a fast pace, and trying to keep current does not always work. Let us know about your experience in failure, and how you worked to not fall into a pattern of repeat mistakes. We welcome educational and informative proposals that will help others learn from what worked and did not work for you, and we are especially interested in proposals that developed expanded and innovative current practices out of your failed attempts. The overall program will result in a diverse array of presenters and perspectives, from firm, court, and academic libraries, and all departments therein (collection services, access services, and research services), submissions permitting. Presentations should be 40 minutes long, with 10 minutes for Q&A from the online forum. Proposals must be submitted to both Danitta and Shira by 5:00pm, Oct. 26, 2018. Presenters will be notified on Nov. 2, 2018 of their selection. Description of session, or abstract (250-500 words max): Please include two or three takeaways, learning objectives, or questions for attendees. The fall conference will be Friday, November 17, 2017 at the Salem Waterfront Hotel, 225 Derby Street, Salem, MA 01970. The topic of the conference is Hysteria, Hyperbole, and Witch Hunts: 1697 & 2017. This year LLNE will be partnering with SNELLA for an interesting and informative day dedicated to historical legal research in the context of the Salem witch trials, teaching information literacy in an era of fake news, online civic reasoning, detecting bias in research sources, fact checking, and more. Check out the libguide for preliminary information! More details to follow in the coming weeks! Posted on August 30, 2017 August 30, 2017 Author Ellen PhillipsCategories LLNE Meeting, Meetings & Events, SNELLA, Upcoming EventsLeave a comment on Save the Date! My name is Bear and I am getting ready to go on an adventure. My first stop will be the LLNE meeting on October 28th at The Westin Portland Harborview. While you all are learning about law library assessment, I am going to meet with other stuffed animals to discuss best practices for making boys and girls smile and how to be extra huggable. We are preparing to go to Project Smile, which will deploy us to children who are going through a traumatic experience. I am a little nervous about this journey, and hope you will help by sending lots of nice friends to join me. Since it is LLNE’s 70th anniversary, we’re hoping to send at least 70 of us to Project Smile. Bring a new stuffed animal to the meeting. Bring or mail a monetary donation, and the Service Committee will purchase stuffed animals for Project Smile. 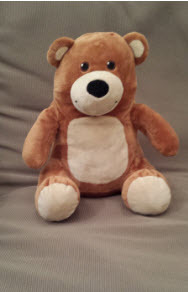 You can get double charitable giving bang for your buck at Kohl’s because the net profits from the Kohl’s Care stuffed animals go to children’s charities. There are also literary classics like Paddington Bear and Madeline for the librarians. As I mentioned before, I’m a little nervous about this journey, and I would love to connect with some of my soon-to-be friends before the meeting. If you’re bringing a stuffed animal, please take a picture and post to Instagram, Facebook, or Twitter. In this era where libraries MUST prove their worth and value to the institutions they serve, data collection and library assessment has become an essential duty we must all undertake. Data collection and analysis will allow librarians to better understand and quantify the library’s strengths and weaknesses, determine the drivers of demand on the library’s resources, along with changes in those demands, and to properly allocate resources. Improved understanding of the data generated will allow librarians to justify resources needed, motivate staff, and better plan for the future. At the fall LLNE meeting, attendees will be introduced to tools used for law library data collection and assessment for all segments of law librarianship. We will also be celebrating LLNE’s 70th Anniversary with a program highlighting LLNE’s history and accomplishments. Please be on the lookout for more details as they develop. The meeting will be held at the Westin Portland Haborview Hotel in Portland Maine (http://www.westinportlandharborview.com/) on October 28, 2016. We look forward to seeing you there! The Service Committee continues to focus its efforts on making connections and building partnerships with public libraries in the New England. This Spring the co-chairs of the service committee will be presenting a session titled Successful Strategies for Managing Law-Related Patron Inquiries at the Rhode Island Library Association (RILA) Annual Conference in Warwick, RI. This will provide an opportunity for the Service Committee members to meet public librarians with an interest in law and to showcase LLNE’s Legal Link project. For the third year in a row, the Service Committee worked with the LLNE Education Committee and the Legal Research Instruction Program (LRIP) to offer two scholarships to New England area public librarians interested in taking the LRIP course. The two librarians who received the scholarships this year were April Pascucci, Library Technician at the U.S. Court of Appeals Library for the First Circuit and Jazmin Idakaar, Generalist Librarian I of the Mattapan Branch of the Boston Public Library. 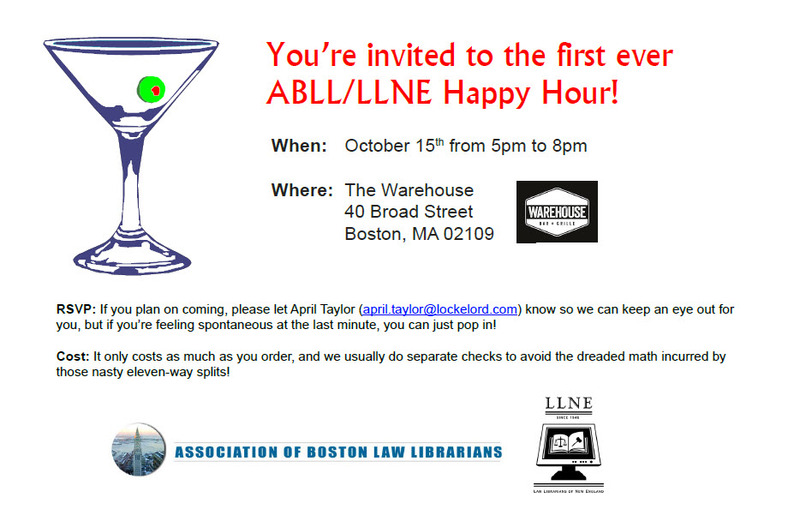 Join your colleagues from ABLL and LLNE at the first ever ABLL/LLNE Happy Hour! RSVP: If you plan on coming, please let April Taylor know so we can keep an eye out for you, but if you’re feeling spontaneous at the last minute, you can just pop in. Cost: It only costs as much as you order, and we usually do separate checks to avoid the dreaded math incurred by those nasty eleven-way splits! 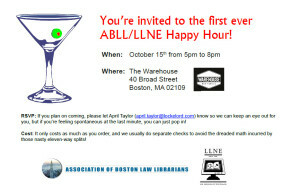 Posted on October 5, 2015 October 5, 2015 Author Melinda KentCategories ABLL, Meetings & Events, Upcoming EventsLeave a comment on Welcome to happy hour! If you haven’t already registered for the LLNE Fall meeting, registration will be open until September 25th. For more information about what Bristol has to offer as a weekend destination, see the meeting’s website. Also, scholarship applications are still being accepted at this time. We are looking forward to the meeting and looking forward to showing you all Rhode Island has to offer!